With electricity prices rising, being able to receive free grid electricity with your solar battery purchases seems too good to be true. Yet what seems like a pipe-dream may now be a reality, at least for customers of sonnen batteries. Energy Matters’ parent company Flex is the the exclusive distributor of sonnen batteries in Australia and as such Energy Matters’ customers can now be eligible to sign up for sonnenFlat packages. SonnenFlat promises to give eligible households (both new users and those who already own a sonnenbatterie compatible solution) flat electricity from just $30 a month, 24 hours a day, even when the battery is empty and the sun is not shining! It’s a revolutionary move from the world’s leading company in home energy storage. It also promises a huge shift in way solar and electricity is utilised and valued in Australia. How does sonnenFlat work? Who is eligible? 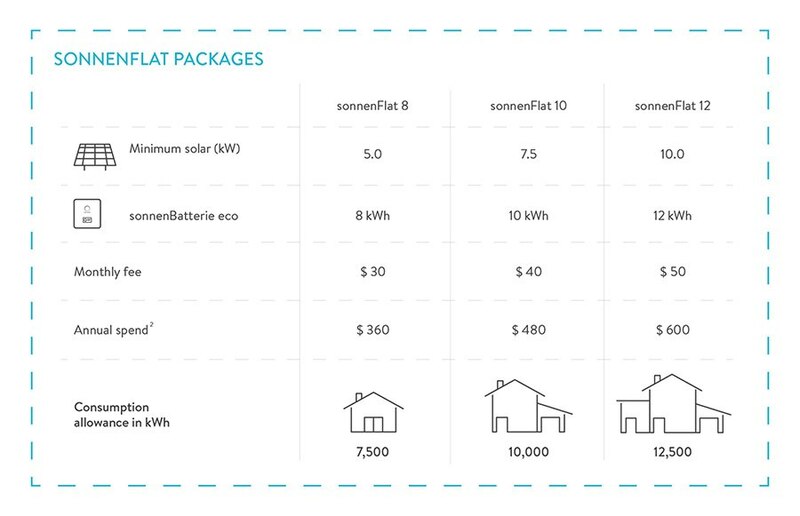 Eligible sonnenBatterie owners who sign up to sonnenFlat will receive access to grid electricity based on the size of their battery system, the total amount of solar power the customer has installed and their expected home energy consumption. In return for giving a customer access to sonnenFlat electricity packages, sonnen will occasionally be able to draw electricity stored in a network of sonnen batteries in a virtual power plant scenario to help balance the energy grid during times of high demand. But the benefits don’t end there. SonnenFlat packages will not only cover a large portion of customers’ energy consumption by replacing with a low monthly fee, but will eliminate daily connection charges helping you keep your bill under complete control. Request a quote today from Energy Matters to discuss home battery storage options with one of our expert advisors. Terms and Conditions and eligibility criteria apply. Germany’s sonnen, the world’s largest home battery storage provider, not only helps maximise the value of your solar power and provides some of the best warranties in the industry, but also provides access to smart features, including self-learning algorithms that help determine the best time to charge and discharge your battery, making sonnenFlat a reality today. The energy revolution is now and sonnen can help you achieve energy independence from the grid! Call our friendly storage experts on 133-SUN for a price on a fully system or retrofit; or submit a quote request online.